Keyboard shortcuts are great. Especially when you’re writing in an online HTML editor, because they don’t require you to take your hands off the keyboard! 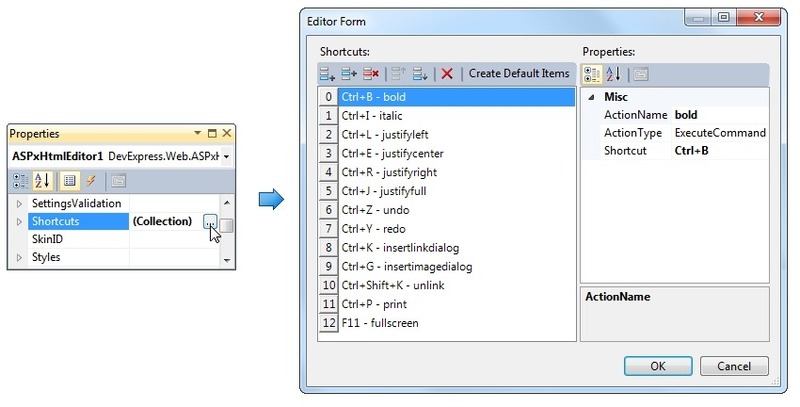 The DevExpress ASPxHtmlEditor editor provides many popular keyboard shortcuts as defaults. And in the latest release of DXperience v2011.2, we added the ability for you to customize these keyboard shortcuts for your end-users (S38048). Here’s the list of the default ASPxHtmlEditor keyboard shortcuts. Notice that the ASPxHtmlEditor provides a way for you to create hyperlinks using the common ‘Control + K’ keyboard shortcut found in many popular office products. Personally, I love that shortcut! There are two ways to customize the keyboard shortcuts, at design-time and runtime. In fact, you can redefine default shortcuts and create custom shortcuts at design time in two ways: using a shortcut editor or directly in a markup. To display the shortcut editor, click the Shortcuts property’s ellipsis button in the Properties window while designing. The code sample below demonstrates how you can specify shortcuts in markup. The first shortcut invokes a MyDialog custom dialog. The second shortcut redefines a default Ctrl+B shortcut. The third shortcut assigns the default command bold to custom shortcut. Note that other default shortcuts (except Ctrl+B) are still in effect. The ASPxHtmlEditor allows you to modify any shortcuts at run time. Simply use the methods provided in the HtmlEditorShortcutCollection collection. The first shortcut invokes a MyDialog custom dialog. The second shortcut redefines a default Ctrl+B shortcut. The third shortcut assigns the default command bold to a custom shortcut. These shortcuts can also customized for the DevExpress ASP.NET MVC HTML Editor extension too! What custom shortcuts have you added to the ASPxHtmlEditor? Drop me a line below with your thoughts, thanks! Save time and money with high quality pre-built components for ASP.NET, Windows Forms, WPF, Silverlight and VCL as well as IDE Productivity Tools and Business Application Frameworks, all backed by world-class service and support. Our technologies help you build your best, see complex software with greater clarity, increase your productivity and create stunning applications for Windows and Web in the shortest possible time.